Some controversial observations about thrombolytic therapy ! Thrombolytic therapy was a mini revolution when it was introduced two decades ago .It has since evolved , not only in the molecular structure but also in it’s usage pattern. The first generation streptokinase is continued to be used even today . While the latest generation thrombolytic agent TNKTPA(Tenekteplase) is threatening to push the old warrior out of CCU. From the beginning , there has been a controversy about the thrombolytic dosage and the speed with which it is to be administered .Let us recall , streptokinase was initially used in various regimes ( 5-30lakh units between a 10 -3hr infusion ) Later ,we arrived at a consensus at 15L units in 1 hr infusion . TPA also experienced the same . Which settled for front loaded regimen(35 + 65mg) . The confusion reappeared when we developed bolus thrombolytic agents( TNKTPA) . In STEMI thrombus formation is often a one time process while thrombolysis is a continuous process. In pulmonary embolism both thrombus formation and lysis is often continuous process . The success of thrombolysis depends on the sustained drug concentration , the pressure at which the drug interacts the thrombus. Many times it is prudent to administer intensive heparin after thrombolysis to prevent recurrent thrombosis. Further , most of the pulmonary embolisms will require long term anticoagulants. How to maximize the success of thrombolytic agents ? It makes sense , to administer these thrombolytic agents over a prolonged period of time so that the lytic process gets wider recruitment of the natural lytic mechanisms. The inadequacies of 2 hour infusion of TPA is glaring in acute pulmonary embolism .We believe a 48-72 hour streptokinase infusion has a definte edge over a short and brief TPA infusion. 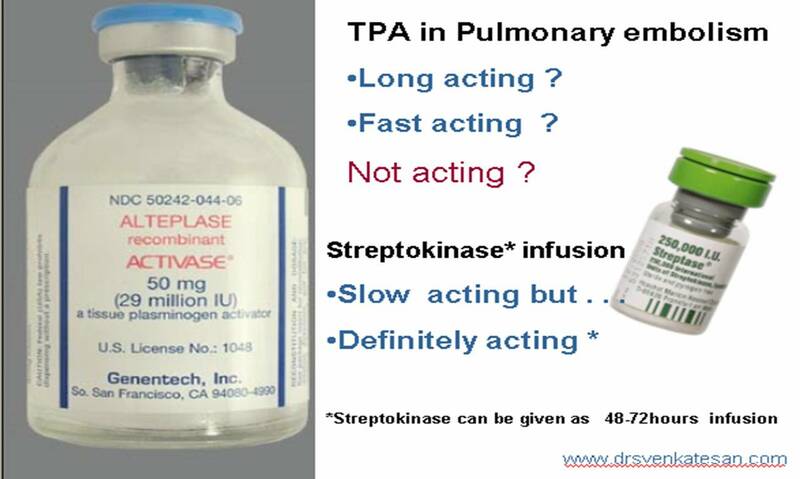 It is yet , not understood why we can’ t infuse TPA as a long term infusion like streptokinase . 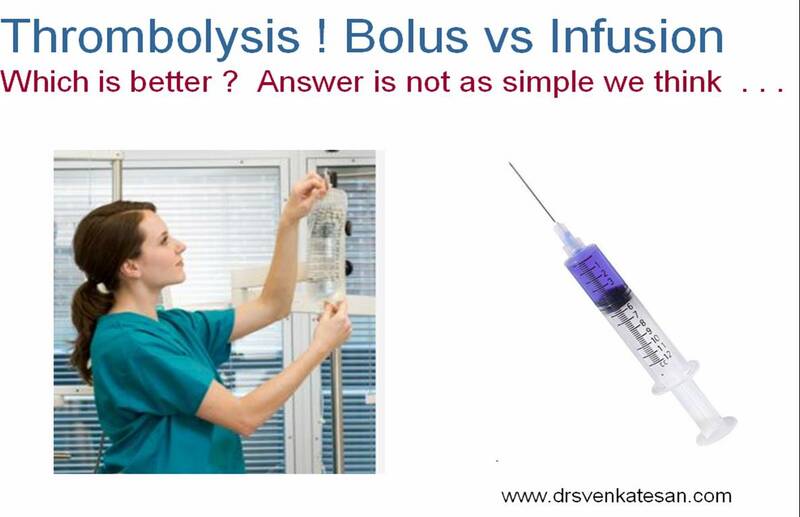 The argument in favor of bolus dose thrombolytic agent is the ease of administration . The other the major advantage claimed is , a 10 second TNK TPA in STEMI can substantially reduce the time window and facilitate early completion of thrombolysis . But , the later concept is hard to prove . . . In fact , there are no controlled studies available for assessing the efficacy of TNK-TPA vs Streptokinase with reference to various time windows. We presume so many things. An incomplete early thrombolysis may not be better than a more successful but slightly delayed TIMI3 flow . As scientists, when we try to answer these question we ask for data . Are we getting it any way ? Are the existing data reflect fact ? We wonder, will we may never get an hourly angiographic data base about the IRA patency in TPA bolus vs streptokinase infusion . It is most unfortunate, with many of the critical questions still to be answered , the cardiology community believes , they have reached the summit of knowledge about thrombolytic therapy . Current perception is , the research on existing thrombolytic drugs is deemed to have been complete . In this hyped era of interventional coronary care , it is a remote possibility to have any further comparative studies on thrombolytic agents . The greatest threat faced by us today is the destiny of modern medicine is often decided in few corporate board rooms and hence research questions rarely emanate from bed side ! Ease of administration should never be the criteria in choosing a thrombolytic agent . 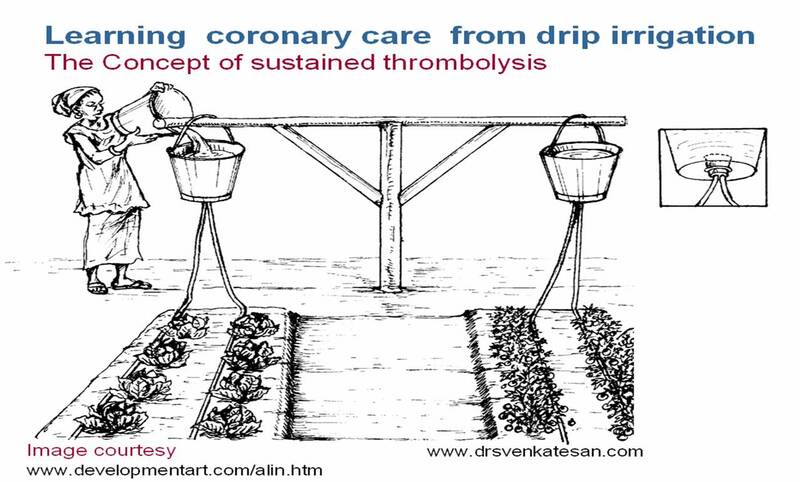 It can severely compromise the quality of thrombolysis ! especially in pulmonary embolism and to a certain extent in STEMI. Success rarely comes with ease . . . Many believe , the choice between streptokinase & TPA goes much beyond it’s academic reasons. TNK TPA (Tenektepalse) has come in a big way to replace streptokinase even in developing countries. Ofcourse it is backed by a huge study ! (ASSENT) . The cost effectiveness and worthiness of TPA over streptokinase was never proved comprehensively. The observation made above is based on personal opinion in about 20 patients . Readers are argued to do their own analysis on this issue and come to a conclusion . Circadian variation in thrombolysis efficacy : Streptokinase works best in the evenings ! In thrombolysis of STEMI , there is a less published , but interesting observation . It is often noted , variation in the efficacy of streptokinase according to the time it was administered.It was most effective in the evenings and least effective in the early morning hours. The mechanism is thought to be due to , pineal gland driven endocrine spikes , that result in a less pronounced progoagulant activity in the evening hours. There could be a therapeutic significance for this phenomenon. The following paper was presented as an abstract in the cardiological society of India annual scientific sessions in New Delhi in 1999.